I pajete, apo i gjalle? I tepruar, apo gjallerues? Cilat fjale do ta pershkruanin studimin tuaj personal te Bibles? Tregohuni i sinqerte. Nese jeni si shume njerez, me shume gjasa do ta keni ndier ne mos nje here nje here tjeter nje sembim faji per faktin se nuk perjetoni mbushulline e gezimit nga koha juaj personale e studimit te Bibles. Ju mund te habiteni se si disa njerez arrijne t'i pershkojne me entuziazem te njejtat pasazhe qe ju i keni lexuar e rilexuar pa ju lene mbresa. Cili eshte sekreti i tyre? Howard Hendricks e di se "sekreti" nuk eshte aspak i tille. Eshte thjesht nje ceshtje e praktikimit te metodave te efektshme te studimit te Bibles. Por, qe t'i praktikoni, ju duhet t'i njihni ato. Kjo eshte pika ku ai dhe i biri, Billi, mund t'ju ndricojne dhe t'ju tregojne hapat e te jetuarit sipas Librit. 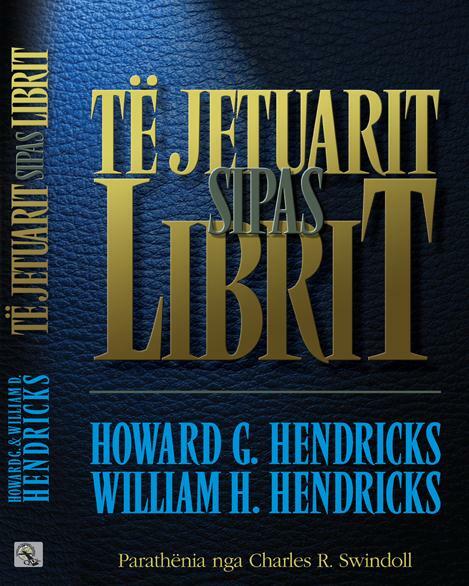 I njohur per mprehtesine e tij, Howard G. Hendricks (Th.M. Dallas Theological Seminary, D.D., Wheaton College) eshte nje profesor dhe lektor i shquar i Seminarit Teologjik te Dallasit. Ai eshte edhe kryetar i Qendres per Drejtues te Krishtere. Dr. Hendricks ka shkruar dhe ka pergatitur per botim shume libra, duke perfshire: Parajse, Ndihmoje Shtepine (Heaven help the home), Te Mesuarit per t'i Ndryshuar Jetet (Teaching to Change Lives) dhe Bashkeshortet dhe Bashkeshortet (Husbands and Wives). Ai dhe bashkeshortja e tij, Xhini, kane kater femije. William D. Hendricks (B.A. Harvard University, M.A. Boston University, M.A. Dallas Theological Seminary) eshte presidenti i grupit Hendricks, nje grup per zhvillimin e komunikimit ne Dallas. Ai ka shkruar nje sere librash, duke perfshire edhe best seller-in Puna Jote Eshte e Rendesishme per Perendine (Your Work Matters to God) dhe Intervistat Perjashtuese (Exit Interviews). Ai dhe bashkeshortja e tij, Nensi, kane dy vajza. Lackluster or lively? Redundant or reviving? What words would describe your personal Bible study? Be honest. If you're like many people, you've probably felt at one time or another a twinge of guilt about not getting full enjoyment out of personal Bible study time. You may wonder how some people can percolate with enthusiasm over the samme passages you've read time and time again -- unmoved. What's their secret? Howard Hendricks knows that the "secret" is really no secret at all. It is simply a case of practicing effective Bible study methods. But to practice them you must know them. And that's where Howard Hendricks and his son Bill can enlighten you and show you the steps to living by the book. Known for his keen wit, Howard G. Hendricks (Th.M., Dallas Theological Seminary; D.D., Wheaton College) is a distinguished professor and lecturer at Dallas Theological Seminary. He is also chairman of the Center for Christian Leadership. Dr. Hendricks has written or edited numerous books including Heaven Help the Home, Teaching to Change Lives, and Husbands and Wives. He and his wife Jeanne have four children. William D. Hendricks (B.A., Harvard Universtiy, M.A., Boston University, M.A., Dallas Theological Seminary) is president of the Hendricks Group, a communications development group in Dallas. He has cowritten several books, including the best-selling Your Work Matters to God and Exit Interviews. He and his wife Nancy have two daughters. Shtepia Botuese: Vernon? Printer: Vernon? See also: Duke Jetuar Sipas Librit. This (Te Jetuarit Sipas Librit) is a re-translation and re-print of the same title.